The water gathered from Well of Zamzam is called Zamzam water. The zamzam well is located near Kaaba in Masjid al Haram, Makkah, Saudi Arabia which is the holiest place in Islam. The well dates back to 2000 BC and is approximately 30m deep and 1.08m~2.66m in diameter. Millions of Muslims visit Makkah each year to perform Umrah or Hajj and drink lots of zamzam water considering it sacred. Just to mention that this well has been fulfilling needs of pilgrims for centuries and water is still in abundance. The zamzam well was revealed to respected Hajra (Hagar) who was wife of prophet Ibrahim PBUH (Abraham) and mother of prophet Ismail PBUH (Ishmael). As ordered by Allah (the one and only God), prophet Ibrahim PBUH left his wife Hajra and infant son Ismail PBUH in Makkah desert. That spot was adjacent to present day’s Kaaba in Makkah, Saudi Arabia. However at that time, it was an isolated place with no food or water. Alone in a desert with a child, the mother was desperate to find water for his thirsty son. In doing so, she ran seven times between near-by Safa and Marwa mountains but couldn’t find any help. However by the order of Allah, a water stream appeared near infant. In her attempt to contain the spring water, Hajra used the words Zam-Zam meaning “stop flowing”. Hence the name of the well. God liked her act of motherly love so much that He made seven times running back-and-forth between Safa and Marwa mountains as part of Umrah and Hajj. As of today, there is an underground pumping station at zamzam well in Masjid al Haram. Although this well is not accessible to public but its water is abundantly available in both mosques i.e. Masjid al Haram and Masjid al Nabawi. Zamzam water is pumped to taps in Masjid al Haram whereas it is transported to Madinah by water tankers. 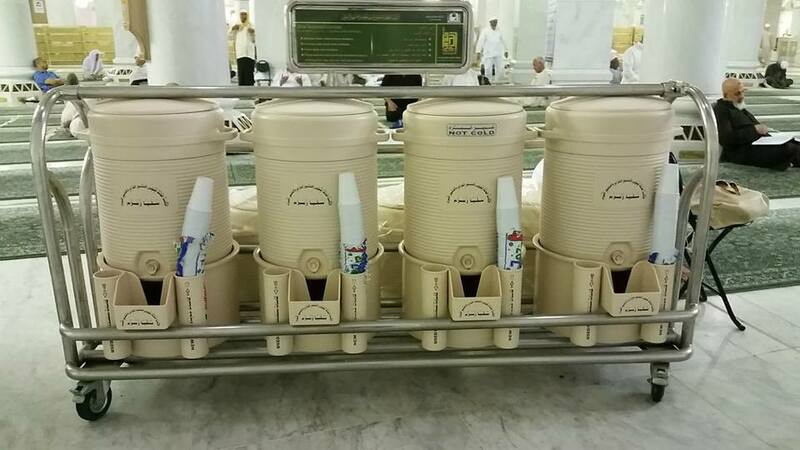 There are coolers of zamzam water identical to as shown in below photo at multiple locations inside both mosques. Almost all coolers contain cold zamzam water. However there’s always one cooler at each place containing zamzam water at room temperature. Look for NOT COLD text for that one. I would suggest to use room-temperature zamzam water if you are suffering from bad throat or cough (which is very common there) or to prepare dry-milk solution for infants etc. 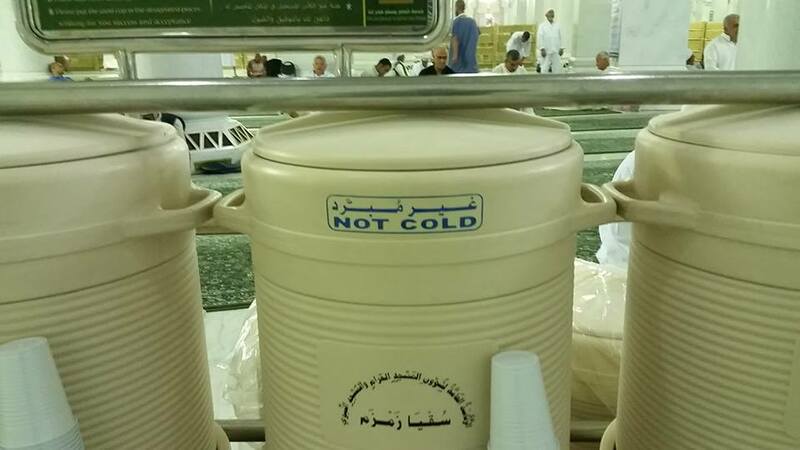 Cooler containing zamzam water at room temperature. 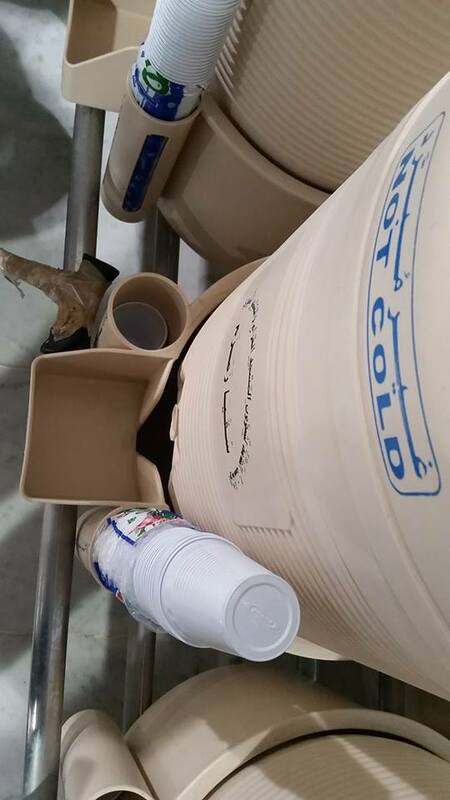 Disposable plastic cups are also placed in specially designed cup-holders attached to zamzam water coolers. It is important to note that new cups are always placed upside-down whereas used cups are placed upside-up. Although there is no harm in using other Muslim’s used utensil but I would recommend to always use new glass for hygienic purposes as getting caught in cough or bad throat is very common there. 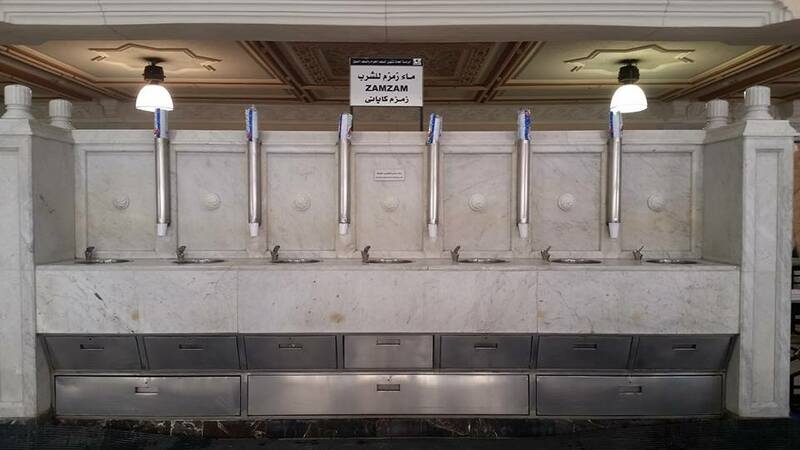 In addition to coolers, there are some taps supplying zamzam water inside Masjid al Haram. All taps supply cold water. There is no tap for room temperature zamzam water. Most of these taps are between Safa and Marwa. All water available inside both mosques is zamzam water. However zamzam water coolers are not available outside mosques. Only zamzam water taps are available at few locations outside Masjid al Haram. Other taps have ordinary water for drinking or for doing wudhu. Read the board first if you are looking for zamzam water outside mosque building. Wadi Al-Jinn (Genie Valley) Near Madinah - Does It Really Exists? Have You Ever Noticed What's Written on the Black Cover of Kaaba? - Introduce my country Pakistan to the rest of the world. - Keep track of my travelogues and share with you. - Explore Islamic historical places specially Makkah and Madinah which are Muslim only places and are not accessible to Non-Muslims. Mostly, I use Nikon D3100 camera for photography. Though occasionally, I also take pictures from Samsung S5 or Nokia N97 mobile. All photos (except two, see if you can find them) in this website are raw as taken from camera without any post processing to make sure that real scenario is portrayed. The entire content of this website including all images and photographs are the sole work & property of the blogger - A Muslim Traveller.